My initial understanding of "Ubuntu" was the one stated on Ubuntu Site : "Ubuntu is an African word meaning 'Humanity to others', or 'I am what I am because of who we all are'. The Ubuntu distribution brings the spirit of Ubuntu to the software world." As such, I was already genuinely interested by the subject and surprised that it was a much more complex and structured philosophy than I expected. For more on this subject, please consult Wikipedia Ubuntu_philosophy page. The book is very easy to read and lightweight : this is a kind of initiatory novel where the hero evolves from a stressed, social hurt, on the edge of loosing his job because of work-induced problems (recent evolution to a managerial job, overtime, no family life/divorce, etc.) to a much more ethical and peaceful state of mind. The company will be transformed as well by this philosophy. The change agent is a young man from South-Africa that happens to embodied the Ubuntu philosophy : he _is_ Ubuntu ! The large corporation where all the characters are working is in a difficult position : the financial crisis is partly in cause and the ethics and core values are not shared anymore by the employees. Business units operates independently and everyone wants to reach its objectives without consideration for the other humans and business units. The Ubuntu philosophy is explained, on step at a time, and it is truly revealed when, a team is visiting South-Africa thanks to a HR department contest. But what is Ubuntu ? One of the sayings in our country is Ubuntu - the essence of being human. Ubuntu speaks particularly about the fact that you can't exist as a human being in isolation. It speaks about our interconnectedness. You can't be human all by yourself, and when you have this quality - Ubuntu - you are known for your generosity. We think of ourselves far too frequently as just individuals, separated from one another, whereas you are connected and what you do affects the whole world. When you do well, it spreads out; it is for the whole of humanity. I have found numerous common point with Buddhism (that I practice) in particular the respect ("don't be evil") and interconnection of every human being (but not only!). This book is very easy to read and very inspiring as it reunite the "evil" corporate world (especially since the financial crisis) with a more ethical world. While I compare Ubuntu to Buddhism, the book is not religious or even philosophical : the wisdom of Ubuntu flow slowly as the book plots and characters appears. 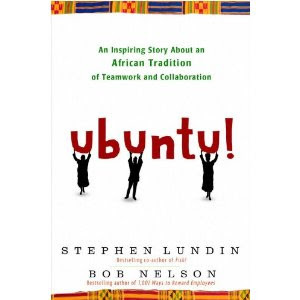 They progress along the path as the reader discover the Ubuntu philosophy.